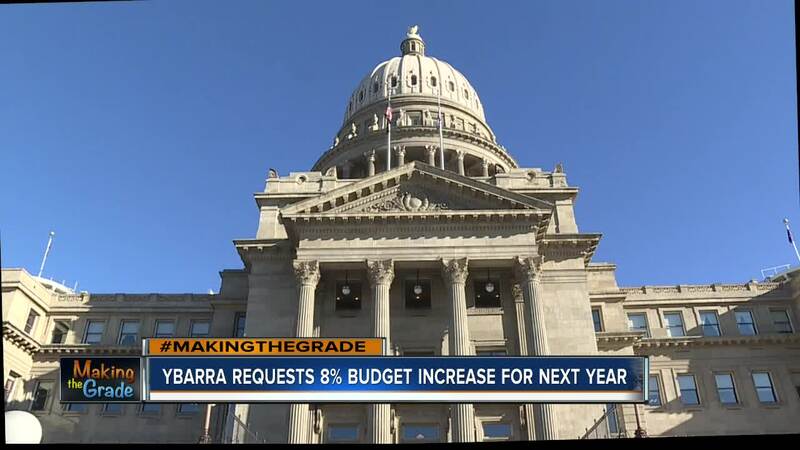 BOISE — Today, Idaho's superintendent requested an 8% increase from last years K-12 education budget in a meeting with the Joint Financial Appropriations Committee (JFAC). That 8% increase is with Superintendent Sherri Ybarra's Keep Idaho Student's Safe initiative. It's above Governor Little's requested increase of 6.1%. Superintendent Ybarra stated her main concerns are that of the teacher shortage and school safety. "It's not uncommon that there would be some differences in our request, but there are some similarities being, you know, literacy is a huge focus I am very supportive of, as well as the career ladder and advanced opportunities," said Ybarra. A $2.2-billion total budget for K-12 education, the line item governor little claims is his top priority; and the largest part of the state's expenses. "I have worked with the governor's office on the budget and would say that the governor and I are on the same page in the book, we're just not on the exact same line," said Ybarra. The biggest reason for the increase is the proposed teacher career ladder. "It's a step in the right direction as far as the educator shortage goes. This is something that everybody across the state has agreed, that the career ladder is again something that they wanted to see as a top priority," said Ybarra. "We are pleased Superintendent Ybarra has recognized the need to boost compensation levels for all of Idaho's professional educators, including more funding for our experienced teachers as well as our early career educators. Her proposed increase in discretionary funding would give districts flexibility and allow them to target resources where they are most needed. Idaho's economy is strong and it is important that we seize upon this opportunity to invest in our students, teachers, and public schools." But even a strong economy may not be enough to support a line item the governor didn't include in his request. "Overall I think she's presented a good budget, a good request. She's got an awful big jump to her kids in school safety program," said Rep. Rick Youngblood. Her school safety initiative is the Keep Idaho Students Safe or K.I.S.S. initiative. "I am impatient when it comes to the funding of safety for our students. I realize this year we do have to live within our means, and we will continue to work on safety regardless of whether there is a dollar bill attached to that or not," said Ybarra, who stated it is an initiative that she will continue to work on in the future. Without that Keep Idaho Students Safe initiative, Superintendent Ybarra's request is a 6.8% increase. Decisions on that budget will be made in the coming weeks. Ybarra also gave a lot of attention to a teacher pipeline to help rural districts find and keep teachers, mastery-based education, STEM education, and dual credit courses. Superintendent Ybarra’s $1.9 billion state general fund request for Idaho’s public schools in fiscal 2020 includes plans to continue and expand successful efforts to improve teacher pay, offer mastery-based education in more Idaho schools, and help high school students throughout the state prepare for college and career through advanced opportunities. New to the public schools budget this session is Keep Idaho Students Safe, or KISS -- the student safety initiative Superintendent Ybarra introduced last spring. Requested support for the multi-pronged initiative includes a $19 million supplemental request to immediately help districts across the state address pressing local safety issues as well as social-emotional student needs and trauma-informed teaching strategies. KISS-related requests include $1.4 million for development and implementation of educator and staff training, with $410,000 of that funding included in the 2019 supplemental and the remainder requested for the 2020 budget year. And Superintendent Ybarra is asking for $101,300 to add a full-time crisis prevention counselor to the State Department of Education staff to help schools prevent, prepare for and respond to risk behaviors and crises. This is the only new staff position included in the budget request. · Working to reduce Idaho’s teacher shortage, attract new teachers and retain experienced educators with Career Ladder pay increases for all teachers, especially the veteran teachers whose experience and expertise is crucial to enhancing Idaho education. The budget request also calls for funding the first year of master educator premiums, which would net qualified applicants an additional $4,000 a year for three years. · Creating a “teacher pipeline” to help rural and remote school districts find and keep teachers for hard-to-fill positions. The superintendent seeks $980,000 to support districts with the greatest need. · Expansion of mastery-based education, which has been highly successful in many Idaho schools. The superintendent seeks $1.4 million to expand the approach to more communities, giving students a more engaging atmosphere in which they advance by mastering the subject matter. · Providing an additional $1.1 million for Idaho’s math initiative, establishing six additional full-time regional math specialists, particularly at the secondary level, to support math teachers in boosting student achievement in a content area that is crucial to a growing number of STEM careers. · Enhancing the already wildly successful advanced opportunities program with an additional $3 million to help students pursue their futures while still in high school and save their families money, earning college credits and in many cases associate’s degrees before graduating from high school. Altogether, Superintendent Ybarra’s 2020 public schools budget request represents a 6.8 percent increase in general fund spending from the current year’s budget – if that 2019 budget is supplemented by the requested KISS funding. Without that supplemental, the requested 2020 general fund budget represents an 8 percent increase from 2019. Gov. Brad Little calls for a 6.1 percent increase in public schools funding, echoing many of the superintendent’s priorities.